The HTC Holiday keeps popping up its head for everyone to see and today it has done it again. It was first spotted way back in August after someone sold it on eBay, and since has seen countless leaks. Today was no different and it was spotted in Australia soaking up the sun and running some impressive 4G speeds. Even today the Holiday was spotted clearing the FCC on its way to the US on AT&T rocking 4G LTE. In the image shown above it’s still being called the HTC Holiday and we are now hearing that is just the internal codename given by HTC. 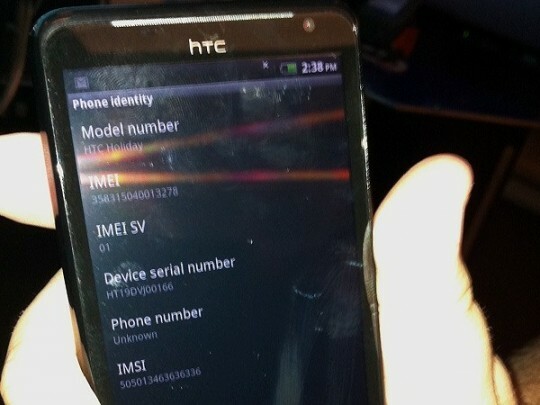 It will in fact be called the HTC Raider 4G on AT&T, and HTC has confirmed that as well. I actually liked the name Holiday although it does seem a bit weird for a smartphone name. Raider 4G gives it that tough and powerful sound, right Oakland Raiders fans? Shown in the image above from the Australian version running on Telstra it seems to be blazing along with those 4G LTE radios. The Holiday will be the first 4G LTE smartphone for Telstra in Australia according to recent leaks and for those waiting for a good phone this will certainly be it. With an aweome 4.5″ qHD display, 1.2 GHz dual-core processor, 1GB of RAM, 8MP camera and more this is a top-end smartphone that is for sure. If you look close you can see Brisbane Australia listed in the speedtest application. We are seeing some mighty impressive speedtest results thus far, hopefully they will be the same when it launches and networks get crowded.